For the last couple of years I've been keeping up with a few Sherlock Holmes retellings. Posts here and here. It's been fun to see how the authors all take a different spin on the tale. Heather W. Petty's Lock & Mori is perhaps the darkest of the bunch, and that really worked for me. Lock & Mori is a Moriarty origin story. Instead of a Holmes/ Watson duo, we've got a Holmes/ Moriarty pairing. And Mori is a girl. A brilliant, troubled, scared, and scarred girl who might be able to beat Sherlock at his own game or may be his true love. These two together are so interesting. Lock is such a buttoned-up good guy, but the reader can tell that he would (and does) compromise his morals for Mori. Mori, for her part, is so worried about twisting Lock into something he's not. The relationship between Lock and Mori is so fraught. I wanted so badly for them to be happy, but I could see the tragedy coming. Mori could see the tragedy coming. I think even Lock could. It's interesting to read about a relationship that everyone knows is doomed. Lock & Mori is pretty dark. Murder is always a serious business, but not all murder mysteries plunge into the potential for human depravity like this one does. In that way it's a bit of an emotional ride because Mori is rather a mess and understandably so. The London setting was a huge bonus for me, in this one. Heather W. Petty does a great job evoking atmosphere, and I just felt like the characters were where they belonged. 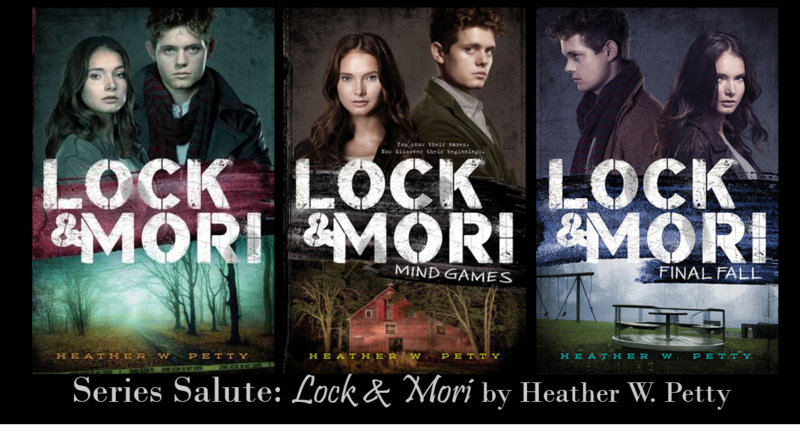 One thing I absolutely love about Heather W. Petty's series is how complicated Mori is. The reader can easily see how Mori could go down path that will lead to the amorality we associate with Sherlock Holmes's nemesis. In fact, Mori clearly identifies and struggles with this aspect of her personality as well. Sherlock Holmes stories carry with them an element of tragedy, and this series has it in spades. I absolutely flew through these books. Books 2 and 3 were particularly fast reads for me. They clock in at just about 300 pages.